It seems the only constant of our travels is that nothing stays static. Especially plans. 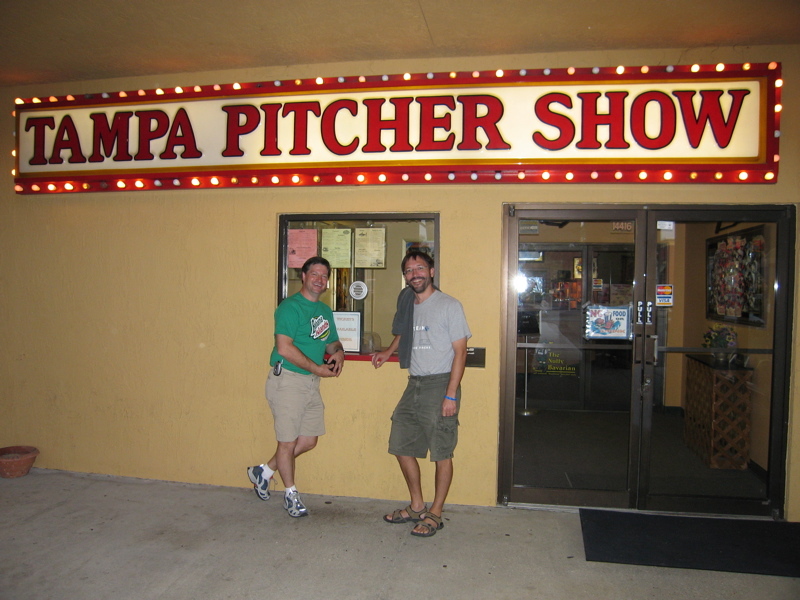 With all of us dispersed to the corners of the United States (Rich in Florida, E&E in Vermont, trailer in Arizona), and reuniting a week later than planned, the rest of our schedule has been pushed back as well. I was already concerned about having time to complete the Summer magazine and get ready for Mexico by March 10, and now time is even shorter. Moreover, we haven’t invested as much time in house hunting as we would have liked, so taking off to Mexico for two weeks seems like a poor choice now. On the other hand, I really want to go to Mexico, and mid-March is likely to be the best time for me to take off from work … so it has been hard to decide what to do. But the decision is made: instead of two weeks in Mexico, we will go for perhaps 3-6 days, and only as far as Puerto Penasco instead of deeper into Sonora. This will at least give us a taste of the procedures involved in crossing the border with an RV and it will have the advantage of keeping our Mexican insurance costs lower. We’ll make notes for a longer trip later this spring or next fall. This will also lower the pressure so that we can make time for a trip to southern California in March or April. Certain friends in the San Diego and Los Angeles areas are expecting us, and I don’t want to disappoint them. Also, Bert & Janie have been in touch. They’re in New Orleans and heading our way. We expect to see them in a few days out in Tucson. I plan to take Bert out for a long bike ride or hike … but he doesn’t know that yet. Tonight I am packing up to head back to Arizona. I’ll reopen the Airstream and get some work done while I wait for Eleanor and Emma to return on Sunday. It has been too long since the Airstream roamed the roads, so I’m looking forward to getting it out again the minute I’ve met my deadline for the Summer issue — assuming that our plans don’t change again! Tonight Brett and I drove about 50 miles over to Haines City, where Wendimere and Bill live. You might recall that we parked the Airstream here last November. Wendimere has just published her first book and the first review copy arrived on Friday, so we came over to celebrate it and have a really nice organic dinner. Wendimere’s book is entitled “The Health Chic Guide: Hip, Fun, and Delicious Living” and although it’s not directly related to Airstreaming we’re going to carry it in the Airstream Life store. I was really impressed with the quality of her work and the diversity of topics Wendimere managed to cover in it. Since she self-published it, people won’t be able to find it at very many places and I think it’s a really relevant topic to a lot of people who are concerned about living a more healthy life. Check it out here. So now I can announce the rest of our plan for the bookstore. Over the past few months I’ve mentioned books that I found particularly good for travelers, like the Mexico camping book by Mike & Terri Church. I’ve decided to try to carry as many of those books as possible in our web store so you can find them if you want, and hopefully some of you will support this blog by buying the books from us instead of from some other online retailer. As part of this, I’d welcome your nominations for great travel books. I’m interested in unusual books that make good reading or exceptionally good information. 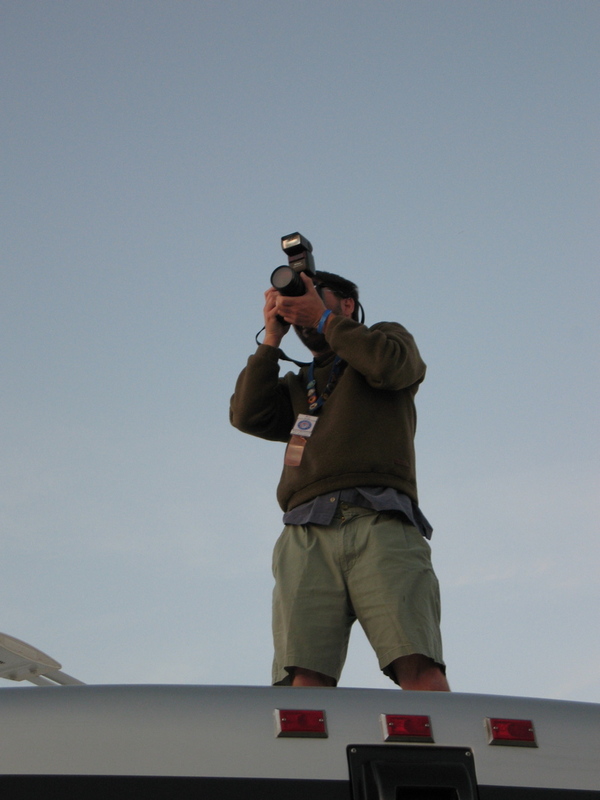 For example, a few months back Andy recommended “Sailing Around The World” by Capt Joshua Slocum. Mike recommended “A Cook’s Tour” by Anthony Bourdain, Wendimere gave me a copy of “Blue Highways” by William Least-Heat Moon, and Bobby lent me “Over The Edge of The World,” by Laurence Bergreen. I liked them all and in the past few months I have recommended them to you. Eventually we’ll get some of these in the store too, and hopefully a few newer books. So let me know if you’ve got a favorite tale or travel resource book that we might want to include in the store and recommend to other blog readers! These days Tampa is like my second home. I hadn’t expected to be here this long, but hey … enjoy it. However, today is Monday and that means plenty of work to be done. Brett & I parked ourselves in his home and spent the day pounding the keys of our computers. It seems like a million projects needed to be addressed: new products in the web store, article editing, planning for the Fall issue, tax returns, customer service issues, bills, etc. I was asked last week at the rally how people can become full-timers and still make a living from the road. I get this question a lot. It’s a tough topic because the answer is so dependent on the person asking the question. Basically my answer is that you need to look inside yourself, decide what you like and what you are skilled at doing, and then follow your heart. Going full-timing is a choice made by people who are willing to take a chance at their dream. It’s only one step further to do the same with your career. The second thing I tell people is that they need to consider whether their goal is to make money or to travel. It’s hard to do both well at the same time. Many full-timers I know choose to alternate working and traveling, two or three months at a time. Others work casually on small background projects all the time. I rarely meet people like myself, who work every day and try to wrap travel around a “regular” day job. It’s a difficult arrangement. It works for me because I really like what I do and the feeling of growing a small business is a big reward. Also I have an essential asset: my family is supportive of mixing work and play into one seamless lifestyle. So now you can see why I say, “It depends on you,” when someone asks me how to make money on the road. There’s no simple answer. But — it can be done. Last night when we got back from the campfire Brett commented that Sunday would be a good day to sleep in. But there was no chance of that. The crowd departs this rally early. At dawn we were awoken by the sound of rattling diesel engines, spouses calling to each other, the squeaking of awnings coming down and hitches being tightened. I rolled over and managed to sleep to 8 a.m., then got up to watch the load-out. 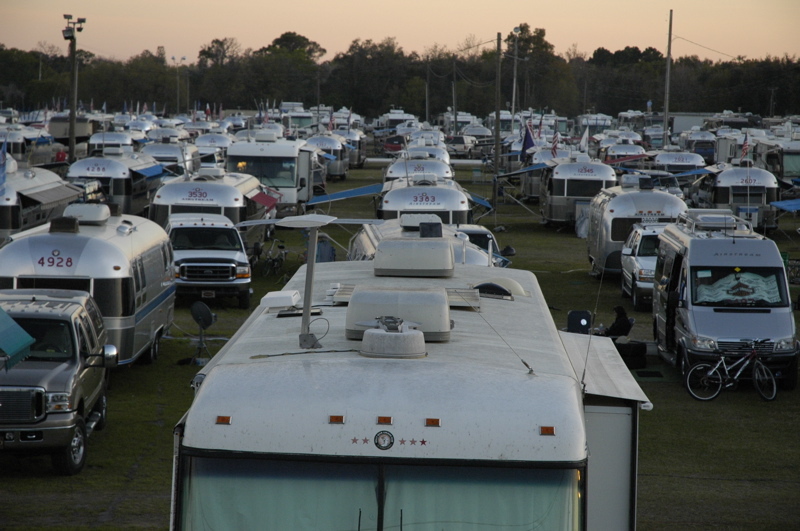 It’s fun to see hundreds of Airstreams slowly ambling along the dusty fairground roads, before hitting the highway. 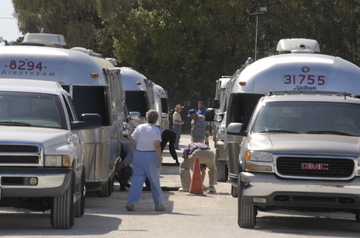 Before they get to hit the road, however, most stopped at one of the three dump stations at the fairgrounds. The line runs about 45 minutes at the peak time, which is between 9 and 10 a.m. By 11, the fairgrounds are mostly empty. It turns out that Emma has a cold and so we have delayed her flight home from Vermont until next Sunday. Since I don’t have any particular reason to run back to Tucson and have plenty of friends here, I also set my flights back a few days, so the blog will continue from Tampa until Thursday. 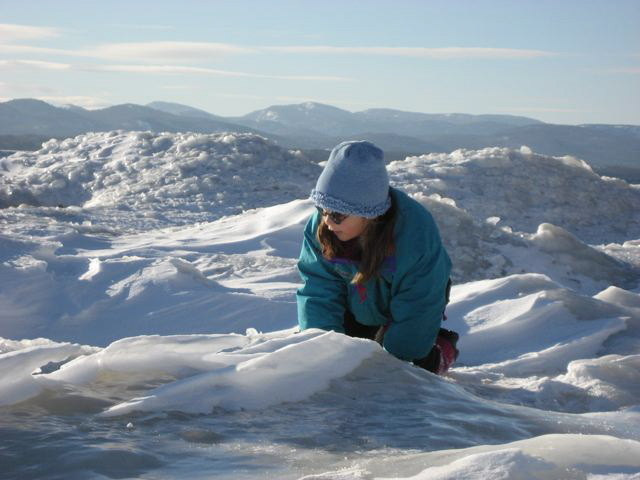 In the picture above Emma is by the frozen lakeshore, but Eleanor reports from Vermont that the ice on Lake Champlain has broken up. I like getting these pictures but each one makes me glad for the sunshine and swaying palm trees of Florida. Saturday is always the big day of the rally, with a couple of really good events on the schedule. This morning we loaded a golf cart with back issues of the magazine, a pile of Airstream Life shirts and hats, and headed to the Flea Market. 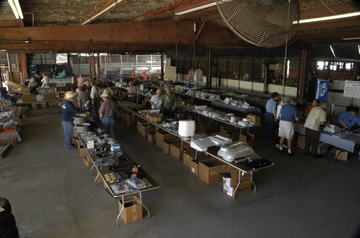 The Flea Market is a great chance to buy and sell all kinds of Airstream-related stuff. Mostly people sell old parts, but you’ll also see books, crafts, household goods, electronics, and apparel. It’s also where I usually see all the folks who didn’t happen to cross paths with me during the week. Someone happened to swing by with a VW Thing this afternoon and it made a nice visual combination with Bill & Wendy’s “Health Chic” Airstream. In the afternoon the other major event of the day was the Vintage Open House. It’s always a great chance to learn something. Two of the newer members were Nikki and Steve, who have a very nicely redone 1956 Safari with a polished interior. That’s Nikki below with her son Chandler. 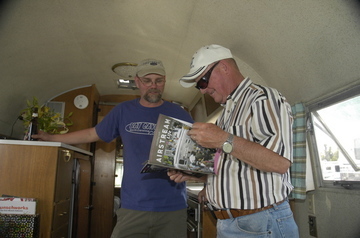 Of course Colin Hyde was busy at the Vintage Open House, educating people about vintage trailers and restorations. He has a photo album of restorations he has done that always amazes people. 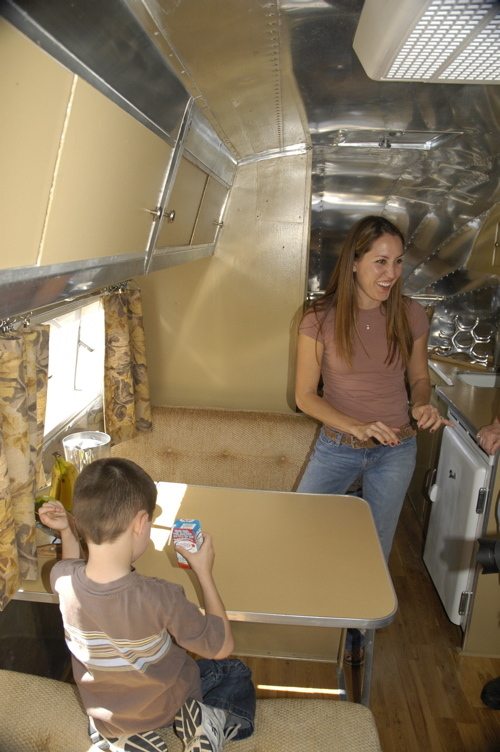 He also has samples of aluminum used in Airstreams over the years, which allows people to compare how the aluminum has changed. Tonight we are out around the campfire with a crowd telling stories. It’s a nice wrap up to a good rally. Tomorrow we’ll slowly pack up and head home. Last night when we got back to the motorhome we found Doug Rowbottom and Colin Hyde sitting outside in the dark under our awning, poking away at their laptops and using our open wi-fi signal. Colin came in for a while and ended up staying until 11:30 … and it had already been a long day … so today I slept in until 9. Colin, poor bald guy, was not sufficiently aggressive with his sunscreen, and after two days at the beach with a baseball cap on, now looks somewhat like a lobster that was boiled with half its head out of the water. He has a good sense of humor about it. We spent a chunk of the afternoon comparing stories with David & Denese Lee, Bill Reilly (the Health Chic husband), and others who randomly walked by until the all-important Happy Hour period began. At every major rally I’ve ever attended, there’s always a zillion Happy Hours. They start up all over the field, organized by intra-club, unit, common interests, Internet discussion groups, etc. If you can’t find one to crash, you’re just not trying. 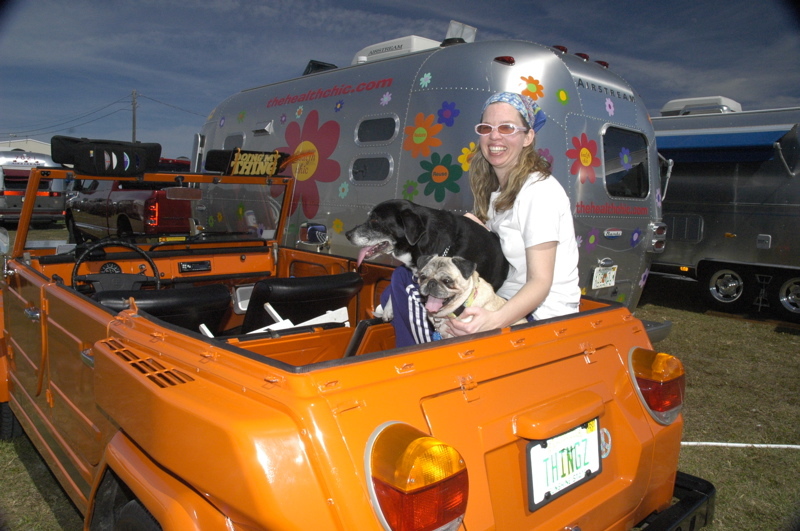 We dropped in on Hunter Hampton’s first, which she holds at every rally for members of her Yahoo group, called “Airstream List”. 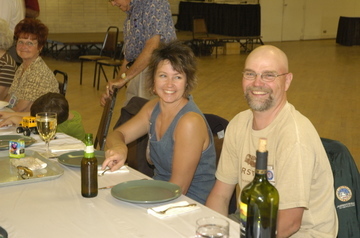 Then we headed off to the Vintage Airstream Club’s potluck, which is large enough to need its own building. This evening I finally got on a roof to take a few shots of the rally grounds. This picture doesn’t begin to capture the entire field, but you can get an idea. Plenty of rigs. I’ve had a bicycle to provide transportation for me all week but still haven’t had a chance to tour every row. 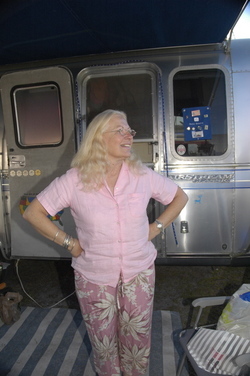 Tonight I’ll head over to the nightly campfire that Colin & Susanne light in a metal pit by their trailer, but try to get to bed earlier. Tomorrow is the big day, the Flea Market and then Vintage Open House, and those events will keep me very busy. A great day at the Florida State Rally! First off, my ear cleared up, which made me feel a lot better. Second, spectacular clear warm weather. 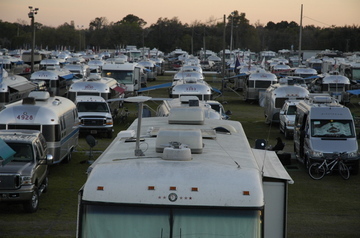 Third, 475 Airstreams parked in a field together. It has been a nice day to hang out and share comradery. Everywhere things were hopping. 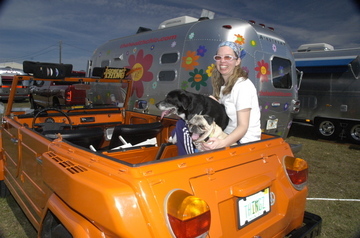 Above is the Airstream store. The service guys were roaming around fixing things, the new product showcase was filled with cool trailers, and I kept running into people I knew. 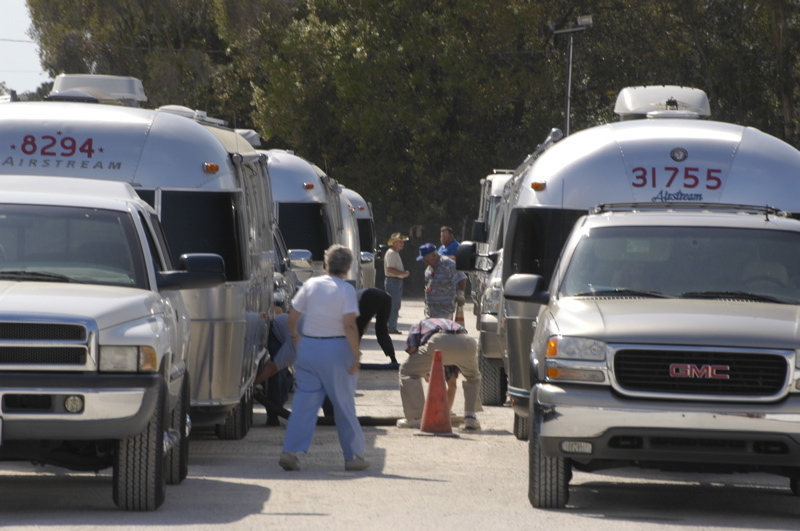 There are several vintage tow vehicles pulling Airstreams here. 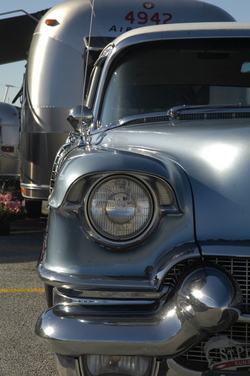 This one is a 1956 Cadillac with a modern 454 engine under the hood. Plenty of vroom (450 hp, 500 ft-lbs torque) and a classy ride to boot. We’ve also had the usual revolving door of friends and curious passers-by dropping in, so the rally feels in full swing and everyone seems to be in good spirits. But what’s not to like? It’s Florida, it’s February, and it’s sunny. Up in Vermont, Emma made a friend at Uno’s when she was at dinner last night. 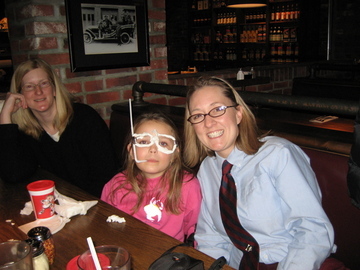 Heather Paine, the waitress, discovered Emma’s interest in snorkeling … and on the spot made her a custom aluminum foil mask complete with breathing straw. 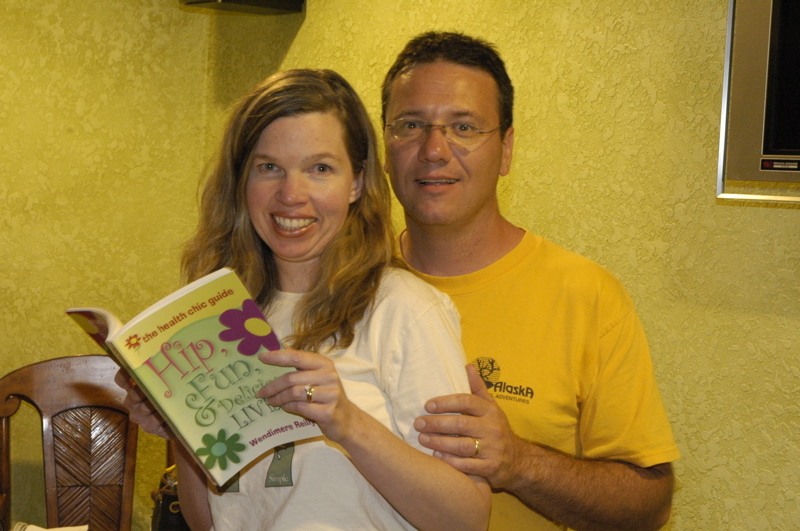 Heather has her own company called Dragonfly Gifts of Vermont, which makes candles and gifts. Thanks, Heather!